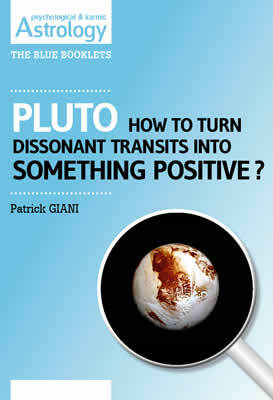 Analysis of Pluto dissonant transit to the Sun, the Moon, the ascendant, Mercury, Venus, Mars, Jupiter, Saturn, Uranus, Neptune, Pluto and the Lunar nodes on the physiological, psychological, events, spiritual and karmic. What will change for the signs of the Cardinal Cross (Capricorn, Aries, Cancer and Libra) with Pluto in Capricorn (2008-2023). A4 PDF document - 49 pages approx. For the next few months your energy and your personality are put to the test. There is discomfort in your life and you will be worried and scared without even knowing the reasons why. You know there is something wrong, a feeling of rebellion and deep unsatisfaction, and you sometimes feel like there is a sword of Damocles above your heard. Your energy is decreasing and it's hard for you to keep your cool. This challenge may come from someone else, someone who is trying to have some sort of power over you (hierarchical, financial or sexual) but it may even be yourself trying to influence someone else, consciously or not. In any case, don't let people take you down but you also need to avoid fighting. Learn how to let go when you have to by being humble, even if it is painful. Actually during this phase we will need to radically change our ego. It's time we questioned ourselves, we need to leave the past behind and let go of material things or emotional hang-ups in order to become more creative and real. We need to lay bare our soul in order to change our personality and to become more creative. The good thing about it is that thanks to this transit we become more aware of what's dark in our subconscious. We may need to talk about it in a therapy unless we find our own way to deal with our obsessions, self-esteem or even unconscious desires of becoming « someone ». If the relationship we have with our father (or husband for the ladies) is becoming complicated, it's time to change our behavior in order to have a good relationship again. During the retrograde phase the values of Pluto will probably be assimilated because we usually go through the first phase (check it out in the list of transits) with a lot of resistance. As a consequence we may be rebellious, egocentric or megalomaniac. At the end of this exhausting but liberating period we will realize we have deeply changed, that we are now true to ourselves and that we just have gone through a rebirth. On the psychological plane, this will be the most exhausting transit of all. Probably because the Sun is connected to our personality and that Pluto as well, as much in transit as in square (less in opposition). The Sun is also the shining part of the soul: power of creation. That's where the dissonant transit of Pluto is going to play its part by creating a heavy and confusing atmosphere. It's not Neptune's confusion or Saturn's heaviness, but definitely a strong anxiety with periods of doubt and unexplainable worries. Let's compare for a second the solar system with a carousel on a playground. Suddenly a man who weighs three hundred pounds shows up and decides to keep the carousel from turning by messing with the central pole. He may break it. Our Sun is this pole and this intruder is Pluto that will try to mess it up with its eccentricity and heaviness. The difference is that Pluto is very far from the Sun. However it's hard to forget about it and we will realize that during a transit or a square to the native Sun. As for the distance, we can measure it on a psychological plane: no planetary function is harder to analyze than Pluto in us. Who in here can pretend they totally know their subconscious? By aging and with some wisdom we can analyze the deepest parts of our minds and figure out our instincts. We also need to connect its eccentricity to our tendency to go a little bit too far. We call them « eccentric » when they do or say something that is not considered as « normal », something immoral. Actually this eccentricity is mostly unconscious and everything seems to be now a mystery. Indeed we tend to hide our inner Pluto very early in our lives. Maybe because we unconsciously know people hardly tolerate it. Isn't it hard to bring to light a planet that embodies darkness? On the physiological plane, Pluto shows up by stealing our energy and the needed strength the Sun is giving us. If the Sun is in Taurus, Leo or Capricorn, symptoms will be different. We have to carefully study the house in which the Sun is (this house will have to deal with the consequences of it), the aspects that connect it to other planets, and, of course, the specificity of the house VI that gives us information about the Sun's weaknesses that Pluto is going to deal with. This dissonant transit is going to last around two to three years but thanks to its retrograde phase we often have time to breathe. On the factual plane, Pluto will express itself according to our evolution and self-knowledge. As for people who are not aware of a few powers inside of them or who never question themselves, this dissonant transit might be very destabilizing. They may feel like they are going crazy and they can't control themselves anymore. As a consequence an aggressive person or a car that almost drove them over may take them through paranoia or schizophrenia. They may feel possessed by invisible powers or tracked down by people who want to take them down. As a matter of fact they may become vulnerable and this lack of self-esteem may have bad consequences in their personal lives. Since the solar function of the body isn't working anymore, friends run away from them, co-workers reject them and subordinates don't tolerate their authority anymore. However for people who regularly question themselves, they will realize their fears and anxiety are just the reflection of the darkest side of their soul. They will also realize we have to look at ourselves the way we really are, in our worst aspect, in order to understand the need to change before we can't stand to look at ourselves anymore. First of all it's a real change. As for any change, there is a time to adapt. This usually happens during the first exact transit. Since we don't feel very comfortable, we compensate by challenging ourselves and working a lot. They tend to be very self-critical, trying to surpass themselves and getting as close to perfection as they can. That's why people who go through this transit become obsessed, trying to correct any flaw, any imperfection. Their look is similar to the eagle's, they can see everything. However they put so much into what they do that they are becoming irritating for their friends and family. During the retrograde phase we won't be able to rely a lot on people and we'll have to deal with several issues. There will be a connection with health issues due to a lack of energy (also connected to the weakness of the ego- the house that the Sun controls). The real questioning will last several months and we may lose our confidence and people run away from us. It's only after the last exact transit that we start seeing the light at the end of the tunnel.